Swasthya Yoga is the way of living. Swasthya means ‘Complete Health’ and Yoga means ‘to join’ or ‘to associate’. So association of complete health with your life is Swasthya Yoga. This works in all areas of human dimensions i.e. physical, mental, emotional & spiritual. This Swasthya Yoga is designed by Swami Chidrupananda Saraswathi who is the direct disciple of Pujya Swami Dayananda Saraswathi and jointly developed by Arsha Vidya Kendra & Vijay Foundation, Mysore. The conceptual knowledge of Swasthya Yoga is given by Swami Chidrupananda Saraswathi while the practice of this Yoga has been taken from various Corporate Wiliness Programmers conducted in VWF group of Industries under the guidance of Mr. B. R. Pal. Corporate Wiliness Programmers are developed on the basis of three Step Rhythmic Breathing and Refining Exercises given by Sri Yogi Bavaria of Mumbai and yogic exercises tailored to the needs of corporate world. Practice of Swasthya Yoga will result in giving us health, vitality, peace and happiness. 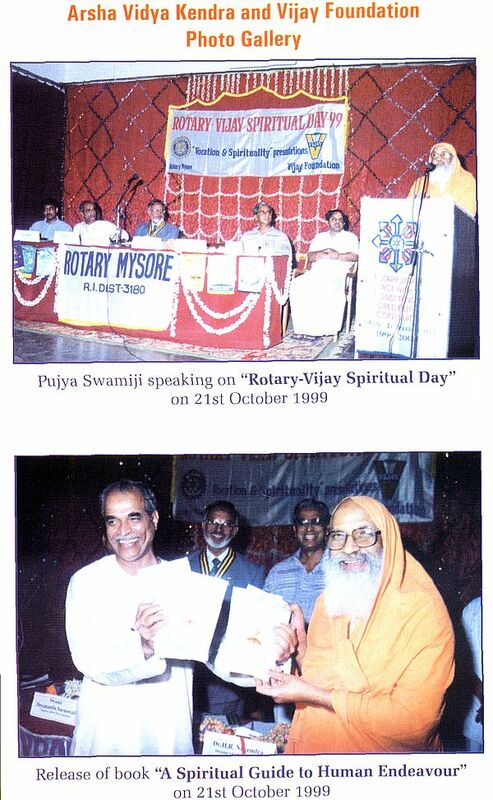 Swathya Yoga programme was inaugurated by Sri Swami Chidrupananda Saraswathi on 27th August 2005 at Mysore. Sri Swami Dayananda Saraswati is a distinguished, traditional teacher of Vedanta. 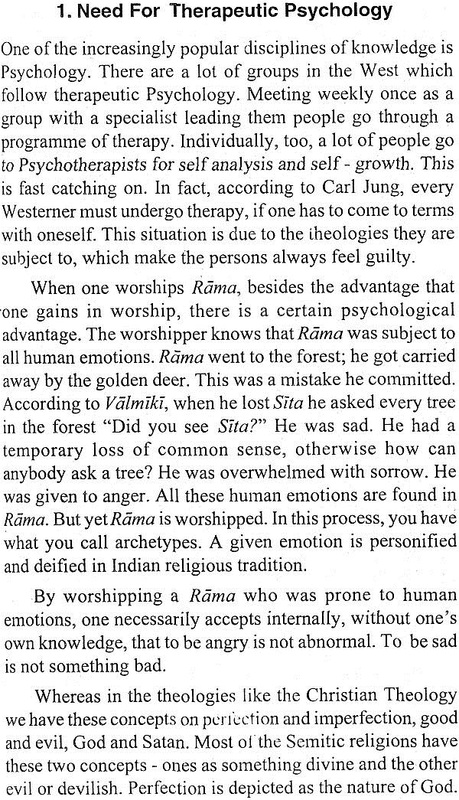 His depths of understanding a nuanced appreciation of Western culture make him –that rara teacher who can communicate the vision of none: duality to modem listeners. He is able to make one see, immediacy. 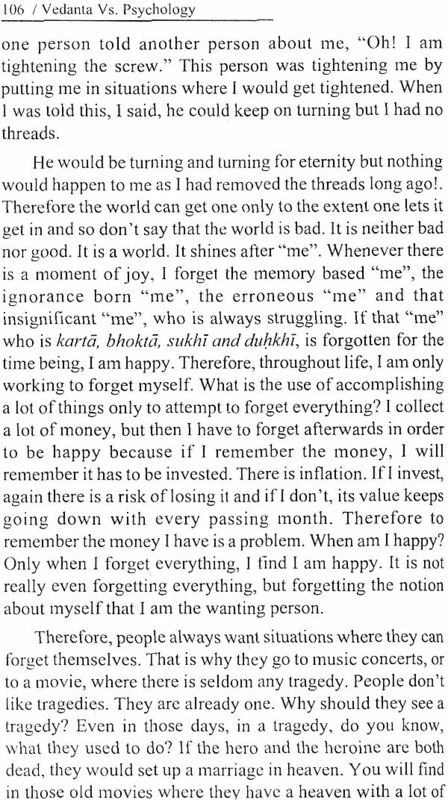 The truth of oneself as the whole. 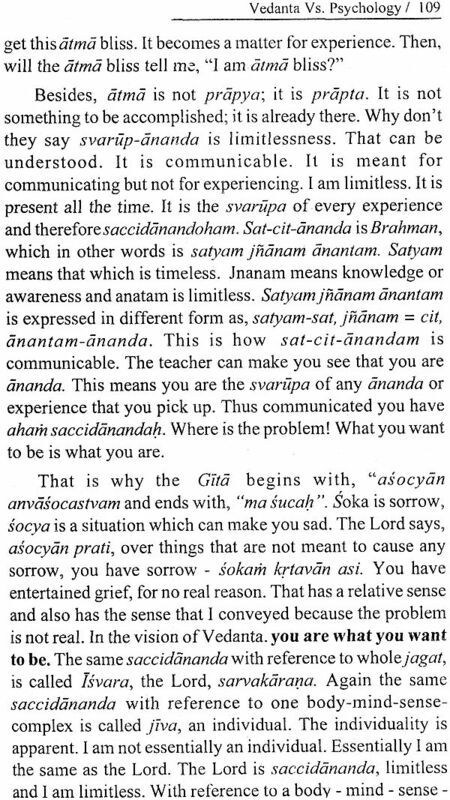 Swami Dayananda has been teaching Vedanta in India for more than four decades, and around the world since 1976. In his public talks abroad, Swamiji has spoken at many of the most prestigious American universities, and has addressed international conventions, UNESCO and the United Nations, where he participated in the Millennium Peace Summit. A teacher of teachers, Swami Dayananda designed and taught six resident in-depth Vedanta courses, each spanning 30 to 36 months. Four were conducted in India, and two in the United States. Each course graduated about 60 qualified acharyas - teachers, who are now teaching around the world. More than one hundred are now swamis and are highly respected as scholars and teachers throughout India and abroad. Under Swami Dayananda’s guidance, numerous centers for Vedic teaching have been founded around the world; the two main centers in India are the Arsha Vidya Ashram in Rishikesh and the Arsha Vidya Gurukulam in Combater. In the U.S., the main center is the Arsha iaya Gurukulam at Saylorsburg, Pennsylvania. At:-present there are at least sixty centers in India and road at carry on the same tradition of Vedantic teaching. Vijay Foundation is a registered perpetual Trust which has “Wipe a Tear and Light a Lamp” as its object statement and “bringing Light to Life and Life to Light” as its mission statement. It was conceived and established with the munificence of Mr. B.R. Pai, Chairman and Managing Director of VWF Industries Ltd, (formerly Vijay Wires & Filaments Ltd.) Mysore, his wife Jayanthi R. Pai and other members of his family in 1994. Other trustees of Vijay Foundation are Sri Harish Kumar Hegde, Advocate, Mysore and Dr. Subbarao, Industrialist, Mysore. 3) Supporting, supplementing and complementing efforts made by like - minded agencies through networking in areas of public good. One of the more important continuous activities of Vijay Foundation is integral development of school children, aged between 6 and 12 years in rural areas, through character building programmers. It also works towards bringing to light many individuals and organizations that have been rendering excellent, productive yet, silent service to society, without craving for publicity, so that they could be role models for others to be emulated. In the recent past it has been concentrating on “Health and Wellness” and has been conducting many programmers for the benefit of the public. Besides Mrs. & Mr. B.R. Pai, the Foundation is guided and inspired by the likes of Dr. H. Sudarshan (the Right- Livelihood Awardee) of B.R.HiIls, Mr. S.N. Murthy, Industrial Relations Expert, Bangalore and Dr. N. H. Atthreya, Management Consultant and Teacher, Bombay. Psychology is the science that studies behavior and mental processes. The term Psychology comes from two Greek words Psyche (meaning the mind) and ology (meaning study). “Psyche” also suggests the breath, life, soul or mind — all of which are without limit. 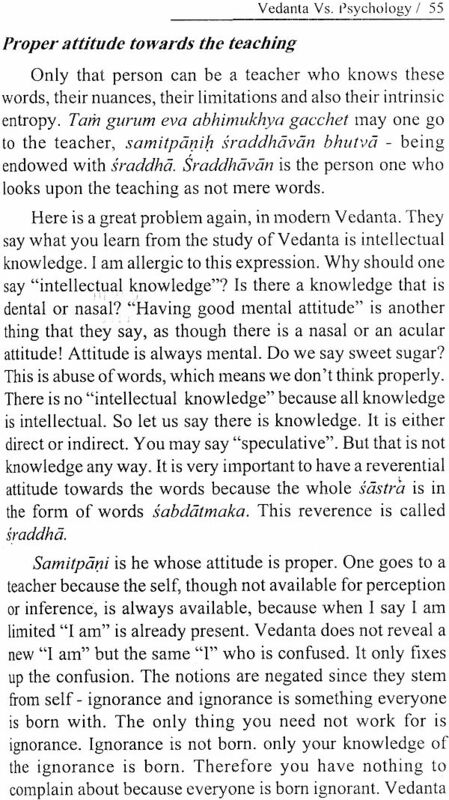 Vedanta — the second section of veda, is a teaching about oneself. 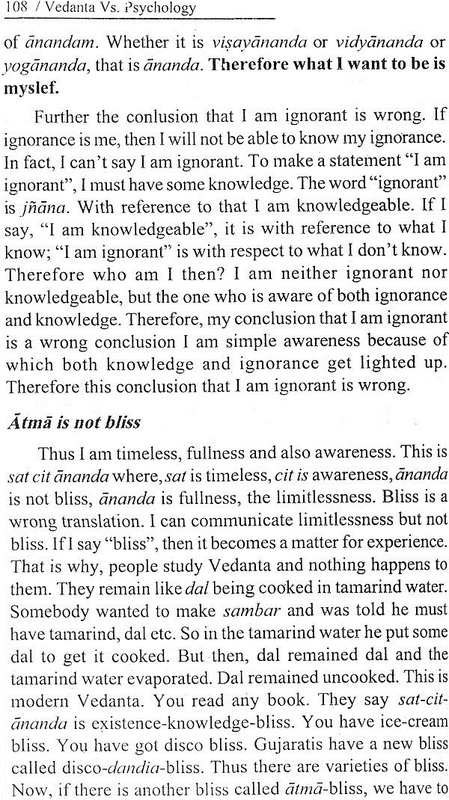 Vedanta is an inquiry wherein one discovers that the real meaning of the word ‘I’ is the self who remains unchanged from childhood to youth to old age, whose nature is pure awareness that is absolute contentment and love, and who is free from any sense of limitation. Psychology can help us manage to an extent. 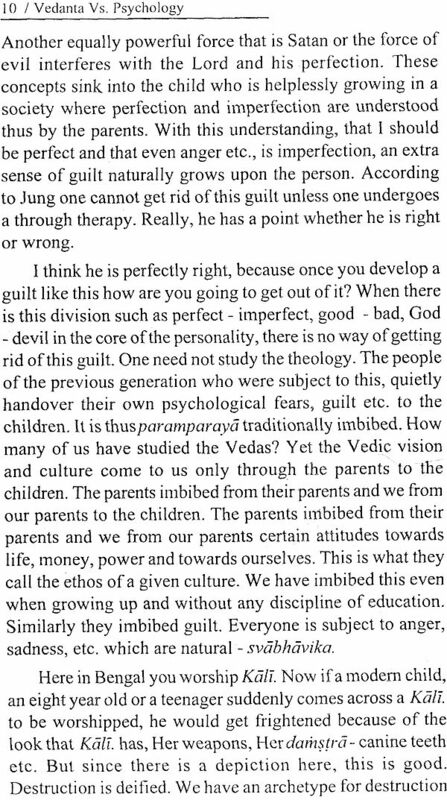 But psychology and psychotherapy are incapable of addressing the human problem, which is a problem of self-image. 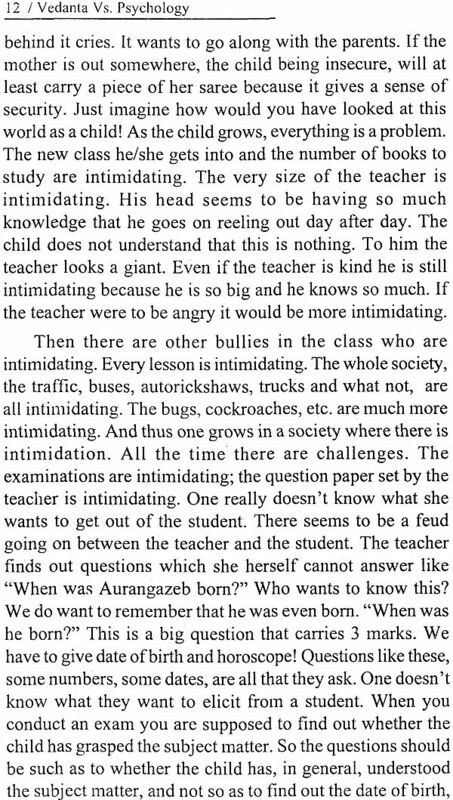 Human beings generally suffer thinking that he is insignificant. He does everything to be significant. 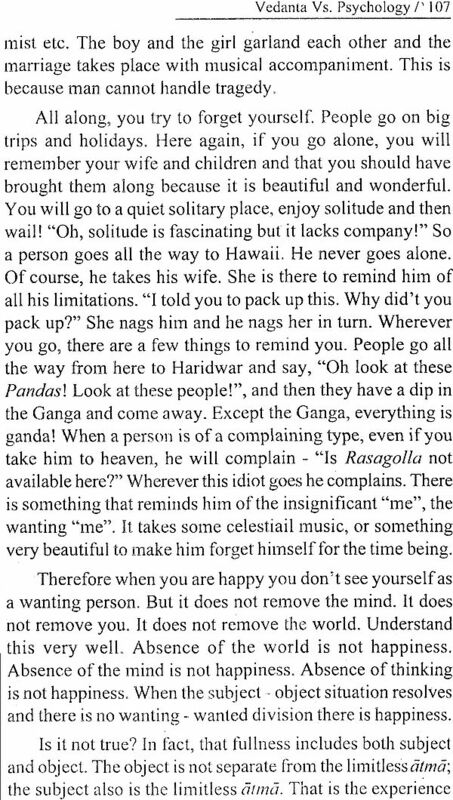 Vedanta shows that you are unlike anything. You are the most significant. Man can be physically ill; then the physician, the doctor is needed. 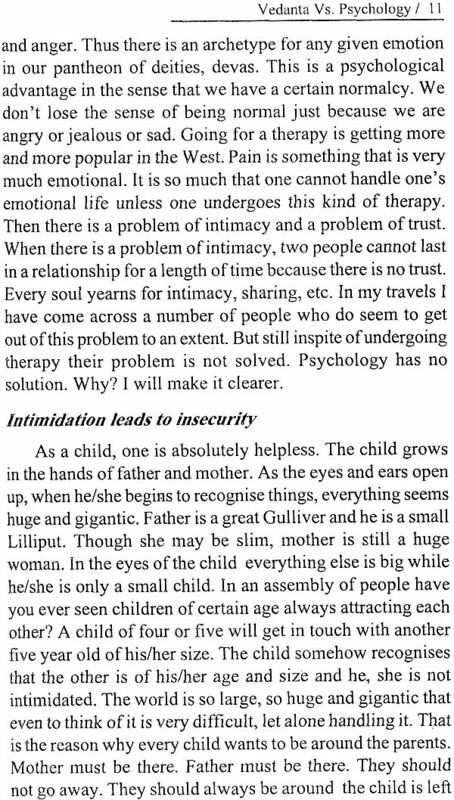 Man can be psychologically ill; then a little help can be given by Freud and Jung and others. But when man is existentially ill, neither a physician nor a psychiatrist can be of any help. Existential illness is spiritual. 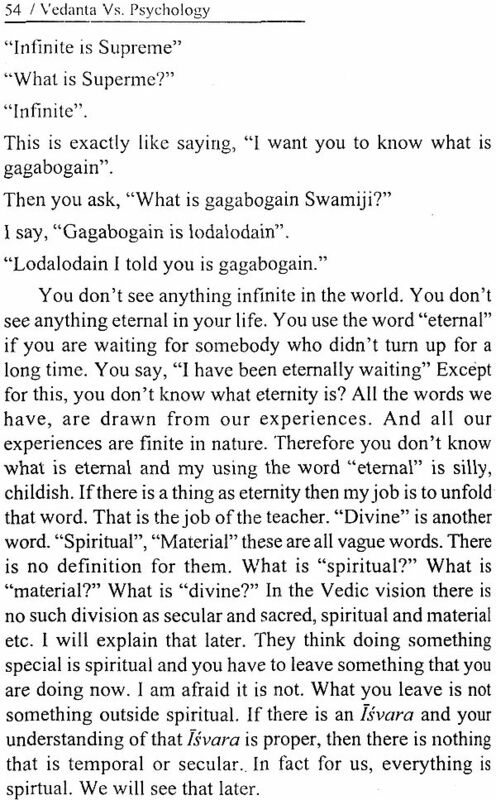 It is neither of the body nor Of the mind, it is of the total and total transcends which is a vedantic attitude. You can transcend consciousness about anything to become consciousness itself- the drop becomes the ocean. Once we understand this, all our problems disappear. 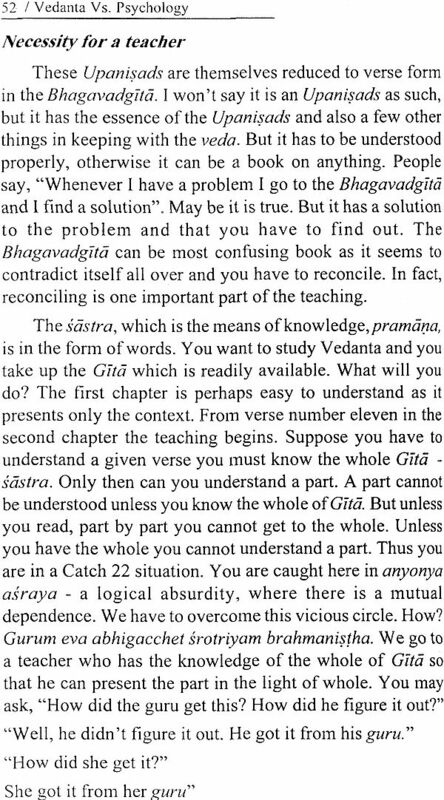 Vedanta takes you to the root of the problem and shows you that there is no problem at all. It introduces you to the real YOU. 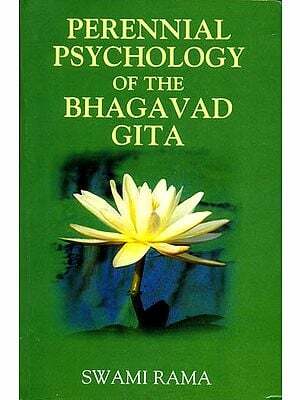 Psychology is the western modern science, whereas the Vedanta is the eastern ancient science. 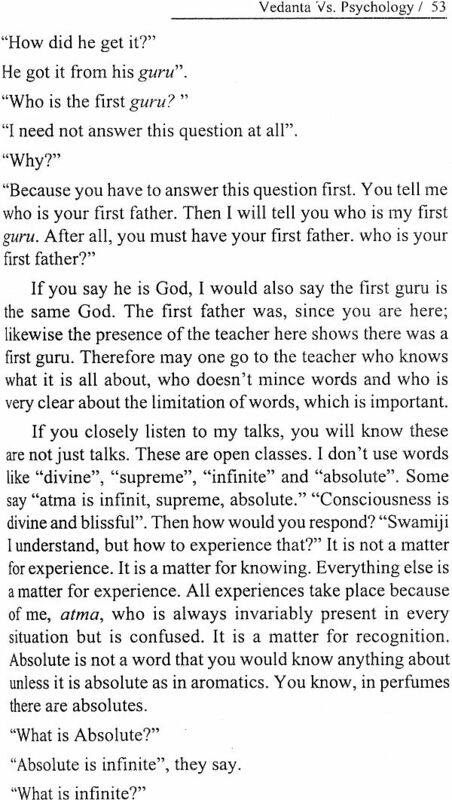 Pujya Swamiji, here in his talks very meaningfully correlates both. We are grateful to Pujya Swamiji for blessing us with permission to print this book. 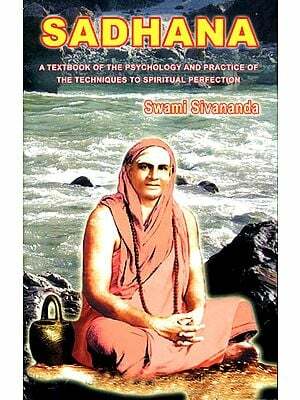 We are also thankful to Swami Chidrupananda Saraswathi for encouraging us at all levels to bring this book into light. Our thanks are also due to Sri P. N. Rangan (‘Manu’), Prof. Chandra Prakash and Dr. Subbarao who helped us in designing this book. We also thank Sadguru Printers who printed this book in time. We are very happy in publishing this book and hope that this book will be helpful not only to the students of Vedanta but also to the common people.